As puppies grow their need to chew also grows. Chewing helps relieve discomfort in the gums of puppies and it also facilitates the removal of puppy teeth, and the eruption of the adult set. Then sometime around 7 months of age, permanent teeth start to come in and the real chewing starts. These teeth seem to require "setting" in the jaw by hard chewing. Dogs who don't do this chewing may have poorer lifelong dental health. 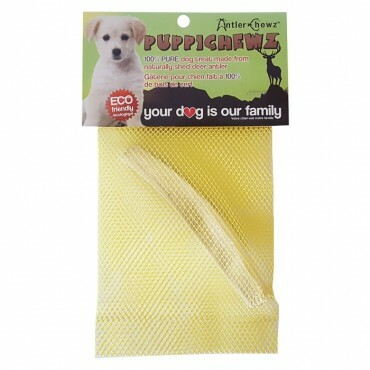 PuppiChewz™ promotes dental health by helping puppies set their permanent teeth with split antlers. Dogs require vitamins and minerals for healthy development, especially puppies. If a dog does not have enough calcium in his diet, for example, he may try to compensate by chewing stones or plaster. Beware of depriving your dog of a balanced diet. PuppiChewz™ can help. It supplies the daily dose of Calcium that growing dogs need. There is nothing artificially added to PuppiChewz™. No chemicals, no toxins, no artificial flavors, because AntlerChewz cares about what our puppies are exposed to. Their antlers come from free range deer that naturally shed them every year. Not one deer is harmed to collect the antlers. Best of all it’s a naturally renewing resource!